The research focus of our group at the Max Planck Institute of Quantum Optics in Garching, lies at the intersection of theoretical solid state and atomic physics. We are particularly interested in the theory of quantum matter that shows a strong interplay of few- and many-body physics. In this context we aim to push further the theoretical understanding of the role of few-body correlations in complex many-body systems which is a key challenge arising in many areas of physics, ranging from high-Tc superconductors, to excitons and trions in low-dimensional semiconductors, to the formation of molecular condensates in cold atomic quantum gases. In order to make progress in understanding complex quantum matter, it is important to identify systems which allow not only to study physics from different perspectives, but which also highlight universal aspects of the underlying dynamics. Discovering such universal connections can provide a basis to establish new phenomena that universally appear in artificial cold atomic quantum system and actual solid state materials with the potential of quantum technological applications. In this spirit cold atomic quantum systems can serve as a platform for an applied quantum simulation of solid state materials and the goal to discover universal connections between both fields drives our research agenda. Remarkably, two-dimensional van-der Waals materials — with graphene being a famous example from this rapidly growing field of research — feature such a unique similarity to ultracold atomic quantum gases. Specifically, excitons interacting with electrons in two-dimensional semiconductor heterostructures realize Bose-Fermi mixtures that are closely related to those studied in ultracold atoms. Indeed, one example for the synergy of the two fields of van-der-Waals materials and ultracold atoms is the measurement of repulsive polarons in two-dimensional semiconductors  following our theoretical prediction [2,3] and their first observation in ultracold atoms [4,5], for a review on recent progress see  and . Building on our expertise at the intersection of solid state and atomic physics, our research group focusses on studying and exploiting such universal connections between solid state and cold atomic physics to theoretically discover novel states of quantum matter and finding ways to actually realize those in experiments. 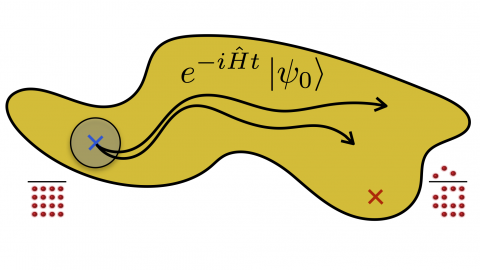 In our theoretical pursuit of this goal we rely on a wide set of theoretical few- and many-body methods (including quantum field theory, diagrammatics, functional renormalization group, time-dependent variational wave functions, functional determinants, and exact approaches to few-body problems). We aim to both improve these methods as well as to develop new theoretical tools that allow to deepen our understanding of universal aspects of few- to many-body dynamics in quantum matter. Our group has many active collaborations with theorists and experimentalists in the United States, Austria, Denmark, and throughout Germany, and we also work in close connection with other groups within the research community in the Greater Munich area. In this regard MPQ is also a unique place where experimental and theoretical expertise in the fields of atomic and solid state physics comes together, providing the opportunity to jointly explore new exciting physics. M. Sidler et al., Nat. Phys. 13, 255 (2017). R. Schmidt, and T. Enss, Phys. Rev. A 83, 063620 (2011). R. Schmidt, T. Enss, V. Pietila, and E. Demler, Phys. Rev. A 85, 021602(R) (2012). C. Kohstall et al., Nature 485, 615 (2012). M. Koschorreck et al., Nature 485, 619 (2012). R. Schmidt, M. Knap, D. A. Ivanov, J.-S. You, M. Cetina and E. Demler, Rep. Prog. Phys. 81, 024401 (2018). M. Cetina, M. Jag, R. S. Lous, I. Fritsche, J. T. M. Walraven, R. Grimm, J. Levinsen, M. M. Parish, R. Schmidt, M. Knap, E. Demler, Science 354, 96 (2016). Rydberg excitations in ultracold atomic gases provide a new frontier to study impurity physics out of equilibrium. 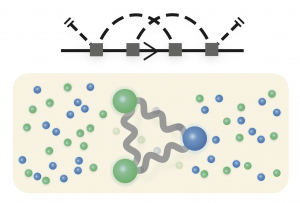 Together with Hossein Sageghpour and Eugene Demler at Harvard we recently demonstrated that Rydberg excitations in ultracold quantum gases provide an unusual addition to the family of polaronic impurities . 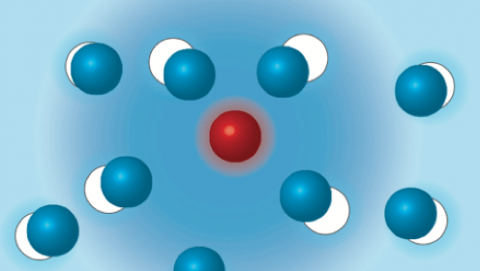 When a Rydberg atom gets together with a neighboring ground state atom, it can form a molecule of gigantic size . We demonstrate theoretically that exciting a single Rydberg atom inside a dense gas leads to the creation of a metastable state — a superpolaron, short a “Rydberg polaron” — in which hundreds of atoms are bound to the Rydberg atom. Such superpolaronic excitations extend the paradigm of polarons as weakly dressed quasiparticles. 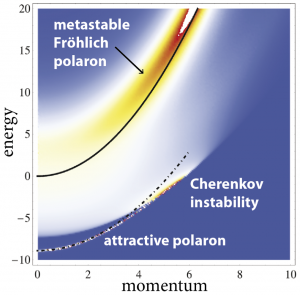 The difficulty in understanding dynamics of superpolaron formation is to take into account competing processes at vastly different energy scales. To overcome this challenge we develop a novel ​bosonic functional determinant approach (BFDA)​ to treat non-equilibrium dynamics in many-body systems. We demonstrated that Rydberg superpolarons are feasible and observable in ultracold quantum gases. 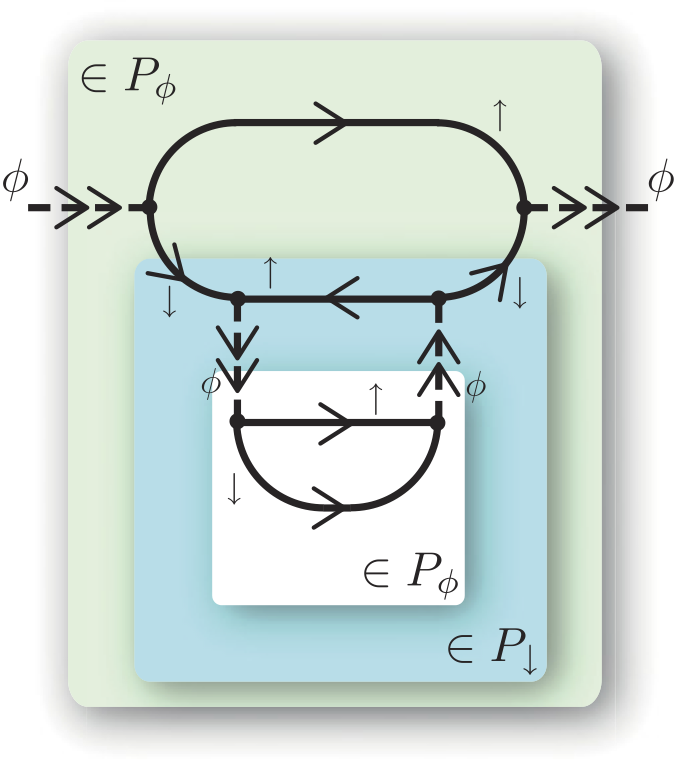 Our approach  is versatile and extendable to a broad class of problems​, opening new possibilities to study impurity dynamics in general quantum many-body systems. In a collaboration with the group of Tom Killian at Rice University we apply the BFDA to Rydberg excitations in a Strontium ultracold Bose-Einstein condensate [3,4]. The measurements provide the first evidence for the observation of Rydberg polarons in experiments. The agreement between theory and experimental measurements (see Figure). demonstrates the strength of the bosonic functional determinant approach to explain the full crossover from few- to many-body physics of an Rydberg impurity interacting with a BEC environment. The theoretical formalism described above only accounts for the scattering of the Rydberg electron of the ground state medium atoms in the triplet spin channel, which can be ensured experimentally by addressing only spin polarized electron perturber-atom configurations. However, experiments can also go beyond this scenario which opens the way to study complex spin Hamiltonians in the context of Rydberg molecular physics. Together with Sam Markson, Hossein Sadeghpour at Harvard, Seth Rittenhouse (Naval Academy), and Jim Shaffer (Oklahoma), we present a calculation of ultralong-range Rydberg molecules in which relativistic contributions are accounted for . We calculate vibrational spectra of ultralong-range Cs(32p) Rydberg molecules allowing for the mixing of singlet and triplet spin states through Rydberg electron spin-orbit and ground electron hyperfine interactions. We find good agreement with observed data  in line positions and profiles demonstrating that our few-body approach can be a starting point for studying complex many-body phenomena. R. Schmidt, H. Sadeghpour, and E. Demler, Phys. Rev. Lett. 116, 105302 (2016). C. H. Greene, A. S. Dickinson, and H. R. Sadeghpour, Phys. Rev. Lett. 85, 2458 (2000). F. Camargo, R. Schmidt, J. D. Whalen, R. Ding, G. Woehl Junior, S. Yoshida, J. Burgdörfer, F. B. Dunning, H. R. Sadeghpour, E. Demler, and T.C. Killian, arXiv:1706.03717 (2017). R. Schmidt, F. Camargo, J. D. Whalen, R. Ding, G. Woehl Junior, S. Yoshida, J. Burgdörfer, F. B. Dunning, E. Demler, H. R. Sadeghpour, and T.C. Killian, arXiv:1709.01838 (2017). S. Markson, S. T. Rittenhouse, R. Schmidt, J. P. Shaffer, H. R. Sadeghpour, ChemPhysChem 17, 3683 (2016). H. Saßmannshausen, F. Merkt, and J. Deiglmayr, Phys. Rev. Lett. 114, 133201 (2015). The Fröhlich model describes a single charge moving inside a polarizable bosonic medium and has found widespread applications. We have studied prospects to realize the Fröhlich model in ultracold atoms and, using a quantum field theoretical approach, we showed that for strong interactions new physics beyond the Fröhlich model becomes relevant . Most prominently the spectrum splits into two polaronic excitations, which indicates the formation of an attractive and repulsive polaron. In early 2016, experimentalists at JILA, Colorado and Aarhus, Denmark were able to observed our predicted Bose polaron states for the first time [2,3]. More recently we extended our approach to the time domain and showed that the quasiparticle picture of Bose polarons may break down in the strongly interacting regime . This breakdown is also visible in the non-equilibrium dynamics of the bosonic environment that can be addressed in Ramsey spectroscopy of the impurity particle. As it turns out this principle can also be reversed: indeed, we showed in a recent work  that the impurity can lead to a characteristic decay of the Ramsey contrast of a spinor BEC where the bosonic bath atoms are brought into a superposition of two internal spin degrees of freedom. Here it is the generation of magnon excitations which form the so-called dressing cloud surrounding the impurity. In cold atoms, magnon excitations can be measured directly using a Ramsey interference protocol and provide a perspective to directly observe the dressing cloud which is a key building block of polarons. S. P. Rath and R. Schmidt, Phys. Rev. A 88, 053632 (2013). N. B. Jørgensen et al., Phys. Rev. Lett. 117, 055302 (2016). M.-G. Hu et al., Phys. Rev. Lett. 117, 055301 (2016). Y. Shchadilova, R. Schmidt, F. Grusdt, E. Demler, Phys. Rev. Lett. 117, 113002 (2016). Y. Ashida, R. Schmidt, L. Tarruell, E. Demler, arXiv:1701.01454 (2017). The concepts of rotation and angular momentum are ubiquitous across quantum physics, whether one deals with the lifetimes of unstable nuclei, the accuracy of atomic clocks, or the electronic structure of defects in solids. Pioneered by the works of Wigner and Racah, the quantum theory of angular momentum evolved into a powerful machinery, commonly used to classify the states of isolated quantum systems. In most experiments, however, quantum systems are almost inevitably coupled to a many-particle environment, which profoundly alters the physics of the system. Together with Mikhail Lemeshko at IST Vienna we developed a new approach to uncover the rich physics associated with quantum rotation coupled to a many-particle environment. We demonstrated that the problem can be described within the quasiparticle picture of an “angulon”— a quantum rotor dressed by a quantum many-body field. Our theory predicts renormalization of the rotational structure, such as observed in experiments with molecules in superfluid helium nanodroplets. 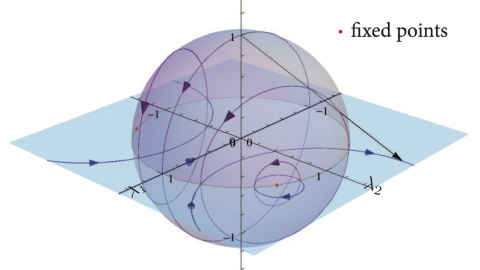 Our approach can serve as a building block of a general theory describing the redistribution of orbital angular momentum in quantum matter, and opens the perspective of application to a broad class of problems in solid state, chemical, and nanophysics. In a follow-up work we derived a novel canonical transformation approach which allows to take into account an infinite number of excitations in the many-body environment . This is a crucial ingredient towards a full solution of the problem, since the angular momentum can be redistributed between infinitely many quantum particles, which renders such problems intractable using other theoretical approaches. Our canonical transformation technique paves the way for understanding the properties of angular momentum in the context of many-particle systems. For a review on angulon physics see . R. Schmidt and M. Lemeshko, Phys. Rev. Lett. 114, 203001 (2015). R. Schmidt and M. Lemeshko, Phys. Rev. X 6, 011012 (2016). 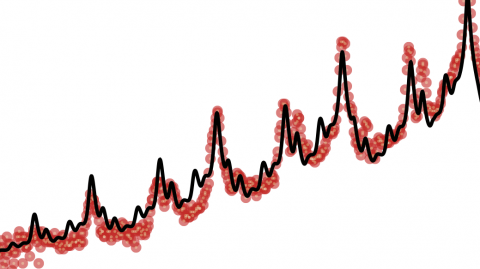 M. Lemeshko and R. Schmidt, Low Energy and Low Temperature Molecular Scattering, Royal Society of Chemistry, Editors: A. Osterwalder, O. Dulieu (2017). Renormalization group (RG) techniques are a powerful tool to study phase transitions and the universal properties of critical phenomena. Close to the corresponding RG fixed points the theory can efficiently be described in terms of a truncated frequency and momentum dependence of correlation functions. 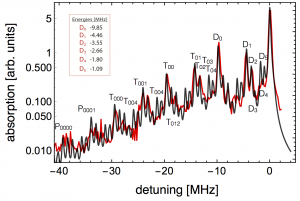 Such truncations are however not sufficient to gain information about the full excitation spectrum of the model. To address this challenge we developed a novel numerical functional RG technique  that allows to follow the RG flow of momentum and frequency resolved spectral functions that can naturally be extended to treat, for instance, competing orders as present in strongly correlated quantum matter. In our work we studied the problem of a single light particle coupled to a Fermi sea that undergoes a transition from a polaron to a molecule for increasing interaction. 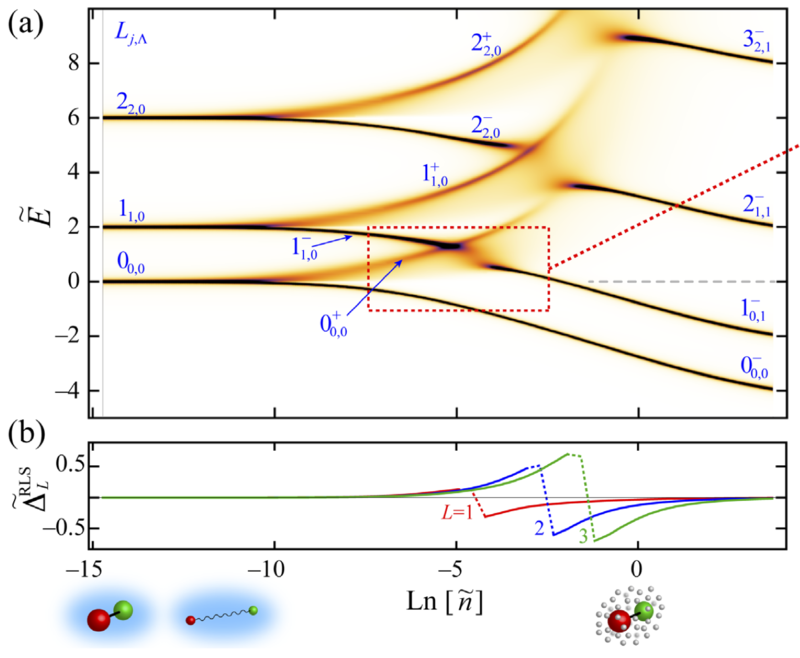 From the RG flow we found a nontrivial power-law dependence of the gap close to the polaron-to-molecule transition and we predicted the existence of a novel, metastable quasiparticle at large energies [1,2]. This repulsive polaron state was recently observed in cold atoms [3,4] and two-dimensional graphene-semiconductor heterostructures . At finite temperature, classical and quantum processes compete in the non-equilibrium time-evolution of a quantum many-body system. A prototypical system to investigate such dynamics are impurities strongly coupled to a Fermi sea. Their many-body character is manifest in the orthogonality catastrophe, where the change of the internal state of one impurity leads to a dramatic reconstruction of the entire many-body system . In a recent work we employ functional determinants to study the frequency and time-resolved response of impurities coupled to a Fermi sea . From the theory of Toeplitz determinants we derive exact analytical expressions for the intermediate to long time impurity dynamics and identify excitation branches in the Hilbert space that dominate the dynamics. At finite temperatures each of these branches corresponds to a quasiparticle with finite lifetime and weight. The latter obeys a power law scaling in temperature with a universal exponent that is solely determined by the scattering phase shift. At zero temperature, the quasiparticle weight vanishes and the dynamical response exhibits power laws, as predicted by Anderson’s orthogonality catastrophe. However, the same orthogonality catastrophe exponent also governs the power law scaling of the quasi particle weight with temperature. We show that these universal aspects of the orthogonality catastrophe can be observed even at temperatures which can be reached with current experimental technology. 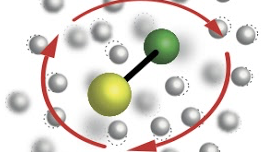 In a joint collaborative effort with the group of Rudolf Grimm in Innsbruck and Michael Knap at TU Munich we studied the experimental realization of this scenario and we show how quantum impurities coupled to a Fermi sea allow for an ultrafast probe of fermionic systems [3,4]. P. W. Anderson, Phys. Rev. Lett. 18, 1049 (1967). R. Schmidt, and M. Knap, Physik in unserer Zeit 48, 6 (2017).